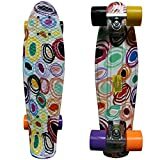 Is it too much to ask for a longboard that has all the features that you desire, great looks and also an affordable price? Of course, not. Although most of the brands fail to provide all of these in one single longboard, Atom does not. So, if you are looking for a longboard that is great for cruising, commuting and carving, Atom has just the right one for you- The mighty Atom Drop Deck Longboard. It will definitely enthrall you with its speed, balance and overall performance. Also, it comes to stay. Now, we intend to let you know what you are getting into with our Atom Longboards Review. Obviously, there are both advantages and disadvantages of your product. What you need to know is if the particular disadvantage will have any effect on your style. Keep reading to know more. If you are worried about how well the longboard will take in your physique or weight, worry no more. Whether you are a heavyweight middle-aged man or a small lightweight girl, this longboard will handle you perfectly. Because Atom makes it in two sizes! If the one with a deck of 41 inches is too large for you, you can always run and buy the one with a deck of 39 inches. Therefore, you will face no problem whatsoever with the size of the longboard. Neither will the longboard face any problem handling you. A mini drawback might be the weight of the longboard. Weighing around 10 pounds, this longboard is rather heavier than others to carry. However, the purpose of a longboard is not to be in your hands but under your feet carrying your weight. As the name already suggests, the deck is a drop-deck. Having the deck closer to the ground allows you more stable and safer rides. Moreover, you get the privilege of having better control on it. In fact, the 80S grip tape aids the deck in providing you with a better control of your longboard. You can go downhill at a maximum speed without the fear of being thrown off. Because the deck is slightly concave in shape as well. This allows your foot to be in a slightly locked situation so that you do not fly off. The deck will also stand rough streets well with its sturdy maple wood construction. This particular material helps the board live through uneven, bumpy streets without giving you any shock. Apparently, the name of the wheels itself should assure you of its functions. The wide-lip Super High Rebound Urethane wheels with a 70 by 51-millimeter dimension, will not only provide you with further stability but also flexibility. The bad memory of wheel bite will definitely disappear with its new perimeter that gives you 9.6 inches of leverage. Moreover, with a hardness of 78A, the wheels provide you with both speed and control during downhill rides. The 50-Degree Reverse King Pin trucks further assure you with flexible movement with its 245mm axles. In fact, you will be able to take sharp and sudden turns swiftly and easily. Lastly, the top-notch ABEC 9 bearings with its pre-lubrication will improve the longboards performance. The Atom Drop-Deck Longboard is, in fact, a piece of art with great features. Its smooth deck surface is laminated to be weatherproof. But, what should appeal to you better is the design. It comes in vibrant colors on a black background. The colors give off a funky vibe and the design makes it catchy with an elegant Atom logo blending in with the rest of the artwork. You would definitely want to show it off once you buy it. After all the features we talked about, you probably already know, which style it suits best- Downhill Carving. It provides you with the stability, safety, maneuverability, and flexibility during your dangerous rides. Moreover, if you plan to go on a long-distance ride, you can go without worry. Durable, sturdy construction that absorbs shock from uneven grounds. A clever deck design that eases and simplifies rides by providing control and stability. Wheels that allow high-speed cruises. King Pin trucks that improve swift movements. Great looks that turn heads. All these at an affordable price. The bottom of the deck gets scratches faster than the high-deck models. Wheels are too soft for sliding. Grip tape not up to the mark. Between a Drop-Through and a Drop-Deck, which should provide a smoother ride? Answer: Apparently, the Drop-deck should provide a smoother ride than a Drop-Through. Because of the short distance from the ground, the Drop-Deck has higher stability and shock-absorbing capabilities, which the Drop-Through is deficient in. Which is better for cruising- the Drop-Through or the Drop-Deck? Answer: In this case, the Drop-Through is better. Drop-Deck is excellent for downhill rides. How much weight can this longboard stand? Answer: The Atom Drop-Deck Longboard of 41-inch deck can apparently hold around 220 pounds without any trouble. 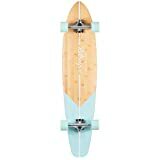 Will this longboard be a good choice for a beginner? Answer: Absolutely. It completely helps a beginner learn faster with it’s easy to handle features providing the rider with greater control, stability, and speed. The beginner may face minimum difficulty with this longboard compared to other. In addition, experts can ride it too. If you live in a place with a lot of ups and downs, this would be a great choice as a daily transport. You can go downhill safely and speedily to reach your destination. Moreover, you can use it all day and all night unless you get tired yourself. Now that you know everything about this longboard, the only thing that should be stopping you from buying it is your required style and how important the cons are to you. Apart from that, the quality of both the material and the build is top-notch. 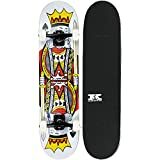 The purpose of our Atom Drop Deck Longboard Review has been fulfilled the moment you decided whether you are buying it or not. Therefore, without further ado, let us take our leave. Toodles!